Is Your Sales Strategy Based On Assumptions? The scene gets played over and over, literally hundreds of times every year. I’m sitting with a sales person or team, we’re reviewing a deal, building a strategy to win it. I’ll ask a question, it could be about the problem the customer is trying to solve, their needs and priorities, the decision-making process, the competition, how differentiated the value proposition is. It could be anything. The question, “How do you know,” is always the telling question. It’s central to whether you can win or lose. The danger sign on responses is when I hear the words, “I think….,” “I guess……,” “This is the way it always happens…” In all these responses, the sales person is making assumptions and not dealing with the specific facts about the deal. Until it something comes straight from the customer’s mouth, until what we think has been tested and validated by the customer, we are just guessing. Guesses destroy our ability to develop a winning strategy. Guesses may cause us to be focusing on things that are irrelevant or unimportant to the customer. A sales strategy based on assumptions is pure wishful thinking. Assumptions are particularly dangerous as we become more “experienced” or “seasoned.” We’ve done dozens or hundreds of deals before. We, “know” how to do things. Our experience shapes how we deal with each deal we face today. But our experience causes us to be sloppy. We make assumptions—our assumptions may be right, but until validated by the customer, they put our strategies at risk. 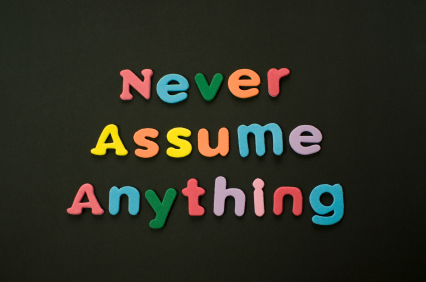 Assumptions are driven by our own guesses, point of view, and experiences. Sales people are eternally optimistic, so that may make our assumptions even more dangerous. We are developing our sales strategies based on our views, not the customer’s. We have to constantly test everything with the customer—in each deal. Regardless how, similar each deal may look, until validated directly by the customer, it’s a guess, and assumption. As you develop and execute your sales strategies, make sure you are acting based on what the customer has said, what you have validated directly with them. Until it comes directly from the customers’ mouths, you are just guessing. Customers Lie, And They Are Stupid Too!